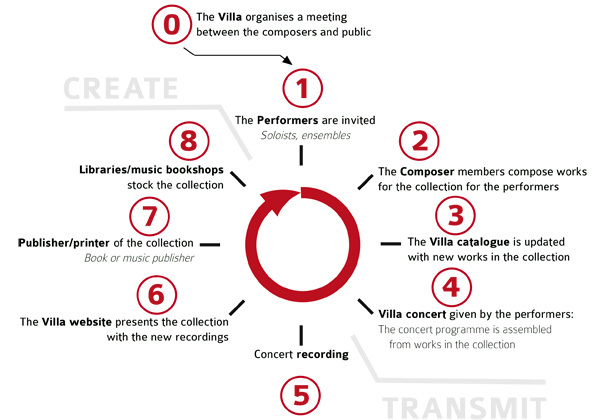 The Villa of Composers has integrated creation and transmission into a positive process that recognises and nurtures the vital and tangible link between composers and the public. The Villa offers a novel concept for collecting works specially composed for performers. The concept is divided into eight successive phases as shown below. Creation and transmission are fundamental values that form the basis of our programme. Stimulating the vibrancy of composers, encouraging performers to excel in their art, engaging and inviting the public to discover new works. Considering that the life of a work and its prosperity stem essentially from the performer, from beginning to end. Placing performers and the public at the heart of all policy in the selection of works. The works associated with the collection and meeting the Villa of Composers' technical criteria are then published by its publisher/printer. The creation period is an important aspect. Each collection cycle evolves at its own pace and can be completed in a few weeks or even several years depending on its complexity. The Villa launches several collections at a time. The eight-phase process spans several years.